Boulderfall Cave is a small cave inhabited by leveled necromancers. It is located northwest of Riften and west of Shor's Stone. The cave is fairly out of the way in the wilderness. There is a small game trail that runs north-southeast near the cave and a path leads from this to the entrance that is marked with several piles of rocks. Above the entrance is a flag post with a flag fluttering in the breeze. 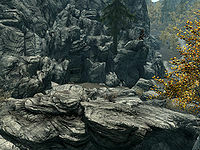 By the base is a medium coin purse and a few paces to the northwest, nestled among the rocks is a novice-locked chest with a corpse beside it. There is a leveled, hostile Necromancer near the entrance that acts as the apprentice for the master within. He may be found sitting on the rock by the flag post above the entrance and may raise the corpse to help with the fight upon detecting you. Outside the entrance on the ground are two random potions. The entrance leads into a tunnel descending to the southwest with two barrels of ingredients on the left where it opens out onto some wooden scaffolding in a small chamber. Be careful as the are three sets of Bone Chimes lining the passageway to navigate and avoiding setting one of these off can be quite a challenge. Any noise will alert the necromancer that is toiling away at an alchemy lab. The necromancer will be of the highest level possible for your level and will immediately attack if alerted to your presence. Once past the bone chimes there is a ramp that descends to the cave floor. Two patches of fly amanita fungus can be found growing in the chamber. There is a corundum ore vein on the northeast wall, to the right of the ramp. Against the north wall is a wooden table with three whole slaughterfish and five seared slaughterfish steaks on top and barrels on either side, one of which contains food and the other ingredients. To the left are a stack of three open crates holding empty wine bottles with more on the ground in front. Beside these are two baskets one containing red apples and the other potatoes. More barrels are to the left with a bottle of wine on one of them and a pile of firewood and a woodcutter's axe beside them. Behind the firewood is a pheasant on the ground which presumably has fallen from one of the five racks hanging from the ceiling above. These hold a further three pheasants and seven rabbits. Finally against this wall is a novice trapped chest. 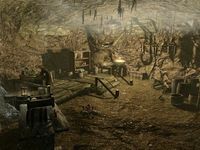 At the rear of the chamber on a low platform is an alchemy lab with a bucket containing five bottles of Nord mead beside it. Along the wall to the right is a set of shelves with three baskets around, one of these holds potatoes, another many bulbs of garlic and the third three carrots. The shelves hold three bottles of ale, a bottle of wine, a bottle of alto wine, several loaves of bread, three bottles of Nord mead, a copy of the Alchemy skill book Herbalist's Guide to Skyrim, a random poison, two cabbages and a leek. To the left of the platform is another table with three more bottles of Nord mead on top and an open crate containing two more cabbages underneath. Southwest of the cave entrance, two leveled bandits and their dog have taken up residence in a ruined hut. Among their meager possessions is a copy of the Block skill book Battle of Red Mountain. Within the Dawnguard add-on installed the bandits are replaced with two Redwater lookoutsDG and no dog. The ruined hut also now contains a trap door in the back room that opens into Redwater DenDG.